During this time when Trump is on the tip of so many American tongues, I’m preparing for an unusually political Share the Wealth. Our conversation this Sunday will not, however, traverse the usual spectrum between liberal and conservative. No talk of Hillary’s emails. No talk about Mr. Trump’s…take your pick. We will instead dive right into the deep end of the political pool and discuss why the Trump administration could pose an existential threat to our Republic based on their utter disregard for American values that transcend partisan politics, things like the freedom of the press and the separation of powers. We will discuss what President Trump (and his administration) have done to compel citizens to protest in unprecedented ways. We will talk about how President Trump could realistically be removed from office well before the 2020 election, as impeachment is a topic I’ve become very interested in recently. And most importantly, I’ll share ideas for how you could help make impeachment happen AND engage in a little bit of activism (through writing) with the potential to have a big impact. Join us for a delicious potluck supper followed by a robust discussion. Perspectives from across the political spectrum are most welcome. 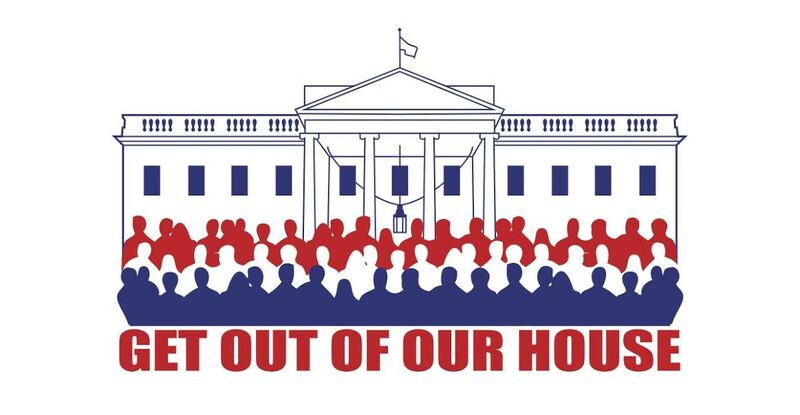 Tony Albrecht is a lawyer and social entrepreneur who recently started Get Out of Our House, a campaign setting out to rally citizens around the single demand that President Trump and his administration be removed from office during 2017. He currently resides in Toronto with his wife Sawil but has returned to St. Louis to engage in the Resistance. 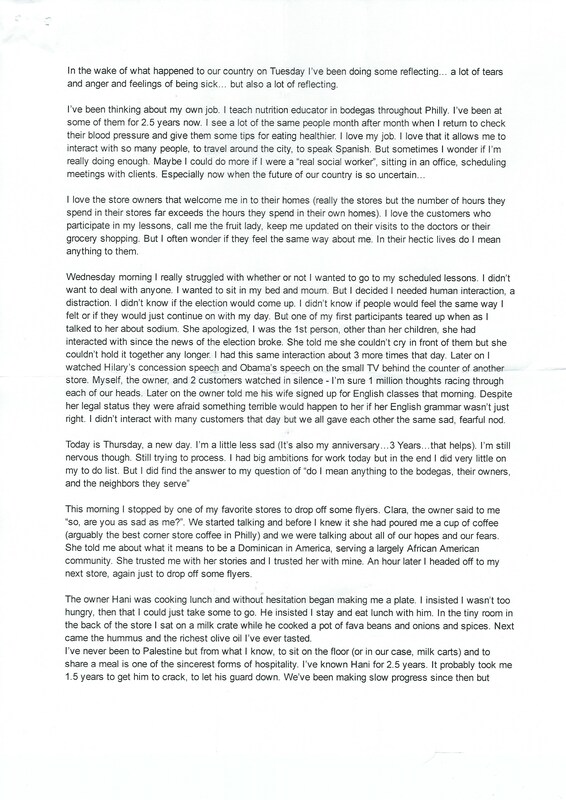 My friend Lindsey Weston sent me this letter in November of last year. I am happy to share it with you. John Gabriel wrote last week that he plans to meet with the archbishop to gain clarity. As I pointed out in my email to faculty on January 11, there is nothing ambiguous about the position of the archdiocese. They laid it out last spring in a document entitled Hope and Holiness. You would do well to read it. I sum up the document in one word. Abuse. Why? The powerful (or so they would fashion themselves) tell the disesteemed how they will experience reality, how they will name themselves, and how they will be lovingly cared for in their disorderedness. I suddenly had the everlasting conviction that any human being, even though practically devoid of natural faculties, can penetrate to the kingdom of truth reserved for genius, if only he longs for truth and perpetually concentrates all his attention upon its attainment. … the same conviction led me to persevere for ten years in an effort of concentrated attention that was practically unsupported by any hope of results. Even if our efforts of attention seem for years to be producing no result, one day a light that is in exact proportion to them will flood the soul. Every effort adds a little gold to a treasure no power on earth can take away. Wherever narrative is necessary to explain, connect, and supply, I furnish it to the best of my abilities; but in the chronological series of Johnson’s life, which I trace as distinctly as I can, year by year, I produce, wherever it is in my power, his own minutes, letters, or conversation, being convinced that this mode is more lively, and will make my readers better acquainted with him, than even most of those were who actually knew him, but could know him only partially; whereas there is here an accumulation of intelligence from various points, by which is character is more fully understood and illustrated. I once wrote for a magazine: I made a calculation, that if I should write but a page a day, at the same rate, I should, in ten years, write nine volumes in folio, of an ordinary size and print. –Dr. Samuel Johnson, quoted in Boswell’s Life. Hope itself is a species of happiness, and perhaps, the chief happiness which this world affords: but, like all other pleasures immoderately enjoyed, the excesses of hope must be expiated by pain; and expectations improperly indulged, must end in disappointment. If it be asked, what is the improper expectation which it is dangerous to indulge, experience will quickly answer, that it is such expectation as is dictated not by reason, but by desire; expectation raised, not by the common occurrences of life, but by the wants of the expectant; an expectation that requires the common course of things to be changed, and the general rules of action to be broken.